Circa 1963. 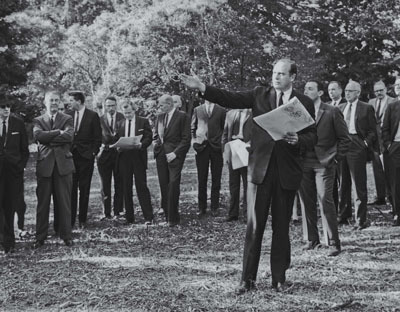 A caravan of Regents on one of their many visits to Cowell Ranch, the future site of UC Santa Cruz. Bulldozers, dirt piles, mobile-home dorms, and mooing muddy cows greeted them in the mornings. UC Santa Cruz was a place of the mind in 1965, and, to a large degree, a place still in the mind; so much of what we now know as the college campus did not exist yet. But the spirit of adventure, and the willingness to follow an ever-changing road map, united UC Santa Cruz's very first graduating class and the faculty and staff members who helped guide their way to graduation. The founding vision of UC Santa Cruz was grounded in a solid liberal arts education with a multidisciplinary focus. It was also centered around small residential colleges, as well as faculty members who prided themselves on their ability to challenge the young students while taking their ideas seriously. This winter, UC Santa Cruz Review set up a "roundtable" of voices from the past and present to reflect on the campus turning 50 years old in 2015. They talked about the many changes they've witnessed, and the ways the place has stayed true to its multidisciplinary and idealistic original vision. The following is a combination of several in-depth phone interviews with the subjects. Dan White's questions are in bold. There was a strong sense of breaking new ground, not just on the physical campus but also in the classrooms. Michael Gerber: It was like living in a forest. It was a beautiful setting and there was no history. Now the campus has institutional traditions you learn about, and there are also upperclassmen. Your behavior as a first-year is mapped against what you see other people doing. The university has rules and procedures, but when we got there, there was not much of that. Everything we were in contact with was being created on the spot. Cowell College was established as countercultural, an explicit experiment: How can you have a small liberal arts college embedded in a university? There were some upperclassmen, and about 100 or so transfer juniors, but they didn't live on campus. We generally didn't see them. It's hard for me to even imagine attending a school with all those earthmovers and a bunch of un-built structures. I think the risk would have been too much for me to handle. I would have thought, "I don't know about this. What if this new campus is going to shut down next week?" Jerry Walters: But I think you're coming at this through today's eyes, and you aren't looking at the situation from the perspective of a 17- or 18-year-old. People were more rugged then. The faculty were young, too. And everybody was in the same situation, all new, all excited, coming to a new experiment. David Kaun: When I got here, initially in February of 1966, the physical buildings of Cowell and Stevenson (respectively, the first and second colleges constructed on campus) did not exist. It was exciting. There were 600 students, and we added another 600 with Stevenson. I had an intro course on economics, and we had four students. Jock Reynolds: There would be chairs and tables in the Field House and they would empty it out to hold a big World Civilization course, and empty it out again to have a meal, and empty it out again and play basketball. We were making it up as we went along. Meg Zweiback: At the end of the year, we had a huge comprehensive exam covering everything over the year from three quarters. Lots of people flunked the test. They hadn't figured out that if you flunked you didn't get credit for 15 units, which meant you were out. I read Bertrand Russell's History of Western Philosophy and crammed in 20 unread books, starting with Plato, in one weekend and passed! UC Santa Cruz was teaching us to think "big picture" and to create themes and to ask questions so if you were (only) a dutiful student and did your work and did not have an inquiring mind you wouldn't do as well. That's a lot of learning in a small amount of time! Did you retain a lot of what you learned? Meg Zweiback: Yes, because the professors, including Mary Holmes in art, had a great gift for making you see things you hadn't noticed before. I can still tell you more about medieval architecture than what I learned when I first went to Europe. This was the mid-1960s before the counterculture really caught fire, before the Summer of Love. Often when people think "'60s," they impose this image that started later on. Jerry Walters: Well, let's put it this way. While they may have looked a lot different when they graduated from here, they arrived clean-shaven, with haircuts and nice clothes. Those were such different times. In those days there was this idea of "In Loco Parentis," where the university was thought to be a parent in a way. As an example, our chancellor had students sign in or out so if parents wanted to find their son or daughter, all they had to do was call the preceptor. They would call up and say, "I haven't heard from my son for a while. Where is he?" We were so small, we could get in touch with people quickly. Well, that didn't go over well. A lot of students rebelled after a while. "This is our time, in our lives, and we will keep in touch with our folks (when we want to)." David Kaun: Stevenson used to have two sets of dormitories: one quad for men, the other for women. After the first year they realized the quad with four dorms of men turned out to be barbaric, so in the second year they intermingled the dormitories, and by the fourth year students could go into each other's dormitories through the first-floor lounge. Every single year the dormitory policy changed. It was not very long before men and women were living on the same floors. It was difficult for parents to come there. "Wait a minute! There's your room, and there are girls next door?" Not the kind of college their parents went to. Maybe it's because of the iconic photos: Page Smith riding a horse through campus, and Chancellor McHenry posing at a desk on an empty field, but I think of the founding figures as larger than life in those days. Katherine Beiers: When I was going to the University of Southern California, I'd read a two-volume book about John Adams by (the late historian, professor, and founding Cowell College provost) Page Smith, and those were two of the best books I'd ever read. When I moved up to Santa Cruz I had no idea he was here, that he was a professor. One day I was working on a Sunday afternoon and he called to see if we had a certain book. Normally you don't just check the stacks when people call (they, of course, had no computerized inventory of books). But this was Page Smith, so I got him the book. He rode into the big foyer of the library, where the café is now. I gave him his book. I checked out the book, and handed to him, and off he went on his horse. I did not make that up. I would imagine that UC Santa Cruz's presence in the sleepy city of Santa Cruz changed the way of life here dramatically by the end of the '60s. Michael Gerber: You have to try to imagine Pacific Avenue (Santa Cruz's famous "main drag") as an old-fashioned downtown much like Soledad or Watsonville with a single movie theater, one large department store, and a bunch of small shops, a sleepy place. In 1965 it was sleepy; there wasn't much of a youth culture presence, and all of a sudden there were 500 freshmen roaming through downtown; that changed the place instantly. It seems to me that the social consciousness that people still associate with UC Santa Cruz— in part because of students' Peace Corps participation—was just taking shape then, and had as much to do with the campus's vision as it had to do with the foment of the '60s. Kathy Gerber: Because I was involved with social sciences, we felt a great need to be involved in making the world a better place to be, and part of the social movement but also exercise our intellectual commitment. We wanted to choose a route in the world that would affect people in the world positively. Part of that was a product of the time, part of that was the social milieu of Santa Cruz, and part of it was the passion of the people we were meeting on campus and in town. UC Santa Cruz has expanded over time. And it's changed in many ways. I know that many founding faculty were upset about the original narrative evaluations becoming supplementary when grades were instituted for all students in 2001. But I was hoping you could reflect on ways that the "original" UC Santa Cruz remains visible or recognizable in the current campus. Jock Reynolds: I've been back there enough to think the spirit of the place is in many ways very much intact though you don't expect everything to remain in stasis. And how does your experience at UC Santa Cruz continue to reverberate with you in your life? Jock Reynolds: I was just thrilled to get into UC Santa Cruz, and I loved every minute of it. During my senior year, they brought a huge number of amazingly important visiting artists. John Cage, Allan Kapro, George Segal, and (international avant-garde art movement member) Robert Watts. Meg Zweiback: My husband and I are 50 years out of college. We both hit 65. Neither of us plans to retire because we do things we enjoy. We're still interested in what we do, and that comes from our education. What UC Santa Cruz did for us—and this was very deliberate—was start with these big broad survey courses and then these small seminars that gave us intimate connections with faculty members who cared to probe and explore what we callow children had to say, these brilliant faculty people who thought we were worth investing in.